Explore the content of local and cloud backups produced by iOS, BlackBerry 10, Windows Phone 8 and Windows 10 Mobile devices! 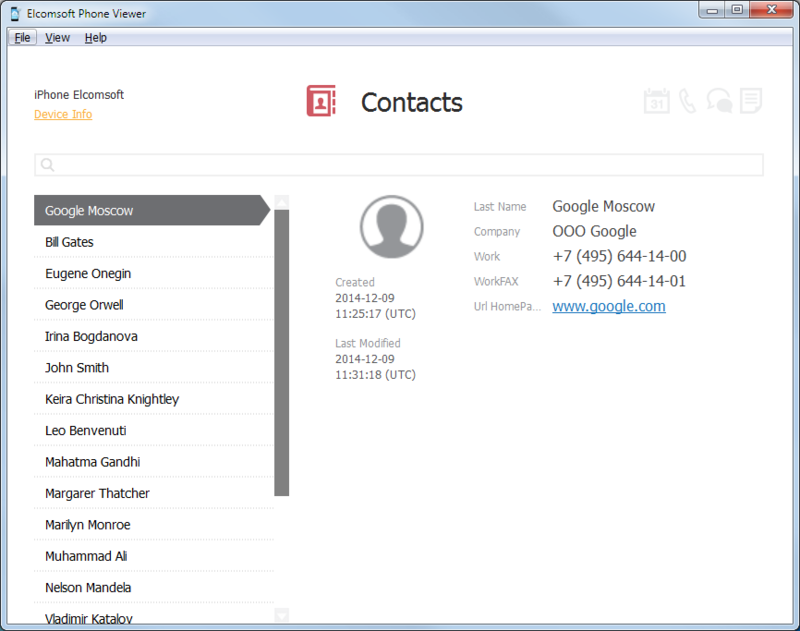 Elcomsoft Phone Viewer is a small, lightweight tool enabling read-only access to contacts, messages, call logs, notes and calendar data located in mobile backups. In addition, the tool displays essential information about the device such as model name, serial number, date of last backup etc. Finally, the tool implements access to deleted SMS and iMessages stored in iOS backups. Yet another “me too” forensic viewer? We looked hard for a tool we could recommend to our customers for viewing data decrypted or downloaded with Elcomsoft Phone Breaker. No single tool on the market meets our stringent requirements on speed, compatibility and ease of use. That’s why we introduced a viewing tool of our own. Elcomsoft Phone Viewer is the ideal viewing companion for Elcomsoft Phone Breaker, enabling full support for all data formats produced by this tool. Regularly maintained and timely updated, Elcomsoft Phone Viewer is the first to receive support for the latest mobile backup formats extracted, downloaded or decrypted with other ElcomSoft tools. Using our mobile acquisition tools? Elcomsoft Phone Viewer is a perfect companion! Note that Elcomsoft Phone Viewer can only open unencrypted backups as well as iTunes backups with a known password. Should you have a backup file encrypted with an unknown password, use Elcomsoft Phone Breaker to recover the password. Elcomsoft Phone Viewer displays the user's online activities including Web browsing history and search queries, browser bookmarks and opened tabs including page snapshots. Information about recent search queries and last visited Web sites already helped solve multiple cases, and will undoubtedly help investigating crime. Information such as call logs, contacts, notes, calendars as well as Web browsing activities including Safari history (including deleted items), bookmarks and open tabs can be synced with Apple servers. Unlike iCloud backups that may or may not be created on daily basis, synced information is pushed to Apple servers just minutes after the corresponding activity has taken place. Once uploaded, synced data can be retained for months with is no option for the end user to clear the data or disable the syncing. Synchronized records can be obtained for extended periods of time; much longer than available in iOS devices and device backups. Existing and deleted records are obtained, and filter can be applied to only display deleted records. Elcomsoft Phone Viewer can display pictures and videos captured with the phone or saved by one of the many apps. But don’t you worry, there won’t be a big mess of thousands of images appearing in a single thumbnail gallery. 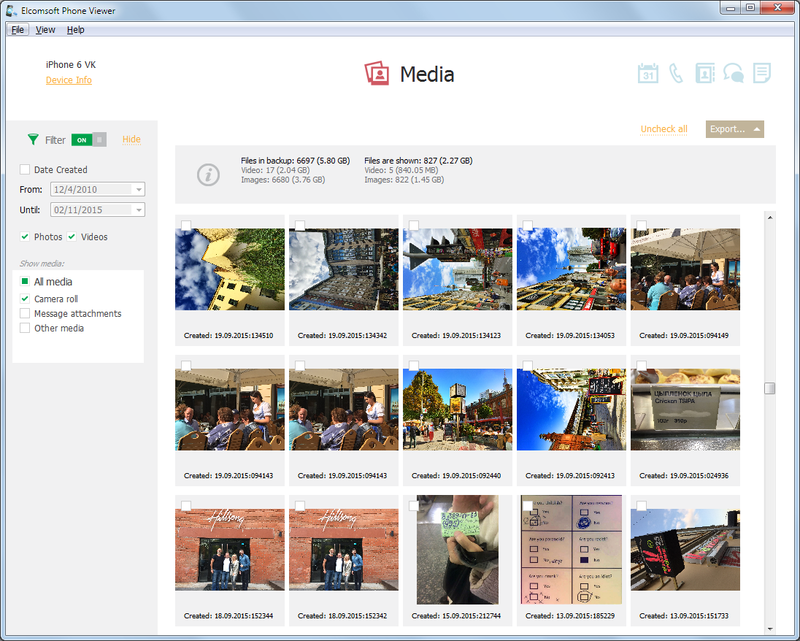 The files will be automatically split into a number of categories, making it easy to discover which pictures were captured with the phone’s camera, or received as messages or attachments. A separate category filters out system and application images such as buttons, logos and splash screens. Album view is available to allow you better navigate through thousands of images. Multiple sources of location data may be available in a given backup or image. Location data may be found in calendar events, iMessage attachments, map caches and system logs. 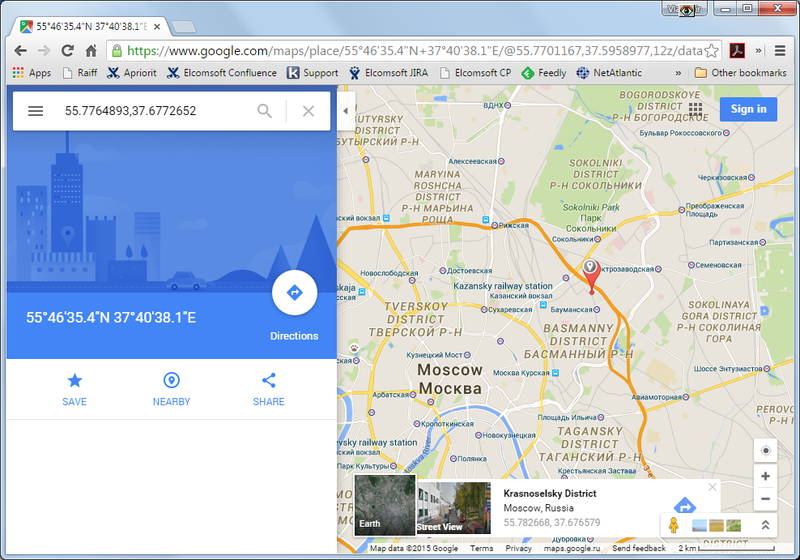 Geolocation is one of the most important EXIF tags available. Elcomsoft Phone Viewer will automatically extract location data from multiple sources, and map the locations with Google Maps. The ability to map GPS coordinates extracted from multiple sources can become extremely handy during investigations. Since the introduction of the iPhone 5s, Apple’s first 64-bit iPhone, physical acquisition has never been the same. For all iPhone and iPad devices equipped with Apple’s 64-bit processors, physical acquisition is exclusively available via file system imaging. The imaging is performed on the device itself in order to bypass full-disk encryption. Regardless of the tool performing physical acquisition, the result of these efforts is always a TAR archive containing an image of the device’s file system. Elcomsoft iOS Forensic Toolkit produces TAR files as the result of the “F” (File System) command. Up until now, most tools available for analyzing information inside these TAR images were integral parts of fully-featured forensic toolkits. The expert's choice would be limited to either time-consuming and labour-intensive manual analysis requiring a high level of expertise, or a highly sophisticated and complex forensic suite, with nothing in between. Elcomsoft Phone Viewer offers the lightweight and convenient third option, enabling fast and easy analysis of evidence found in the results of physical acquisition. The Applications view allows viewing information about the apps installed on the iOS device device being analyzed. The expert can access the list of all apps installed on the device along with their acquisition date (date of purchase for paid apps or date of first install for the free apps). Additional information includes the app version, category, and Apple ID that was used to make the purchase. Since some of that information is not available in the backup, Elcomsoft Phone Viewer automatically requests additional data via an online connection through iTunes. The Wi-Fi view enables access to the list of Wi-Fi networks saved in password-protected iOS backups. SSID, MAC address and password for each network is displayed. Additional network parameters include network BSSID and encryption standard. 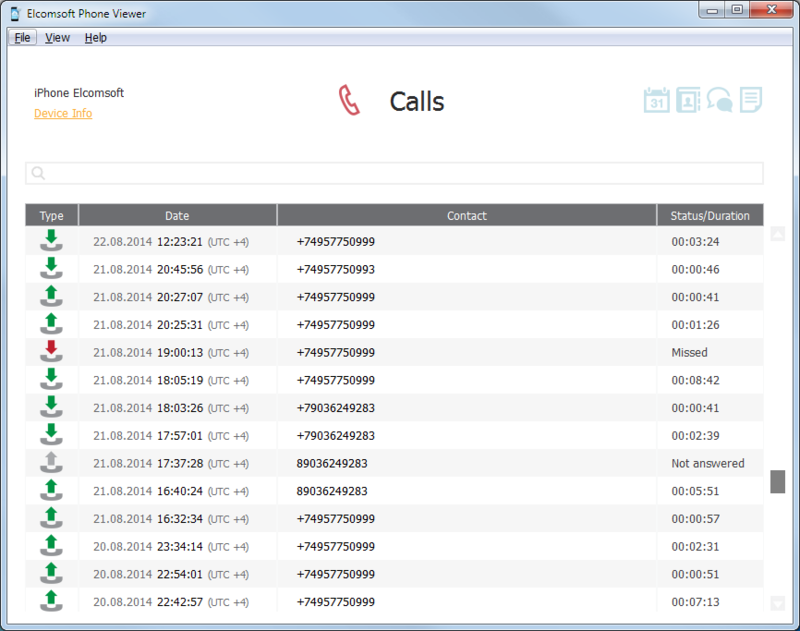 In addition, Elcomsoft Phone Viewer automatically extracts the date and time of first joining and last using the network. Experts can sort the list by last connection time, thus tracking the user by seeing which networks they joined during a given time period. Since version 2.30, Elcomsoft Phone Viewer can display iCloud Photo Library images extracted by Elcomsoft Phone Breaker. Automatic grouping by albums and advanced filtering are supported. Elcomsoft Phone Viewer allows viewing iOS notifications extracted from iCloud backups as well as local backups produced with iTunes. The tool can display notifications going several years back, unless they are read or dismissed by the user. Notifications are an essential part of the system, and may contain large amounts of volatile, highly sensitive information. Nearly all applications that are of forensic significance make use of notifications. Email clients, instant messengers, taxi and travel apps, social networks and many other applications can push notifications. Unless dismissed, these notifications are included into both local and cloud system backups. 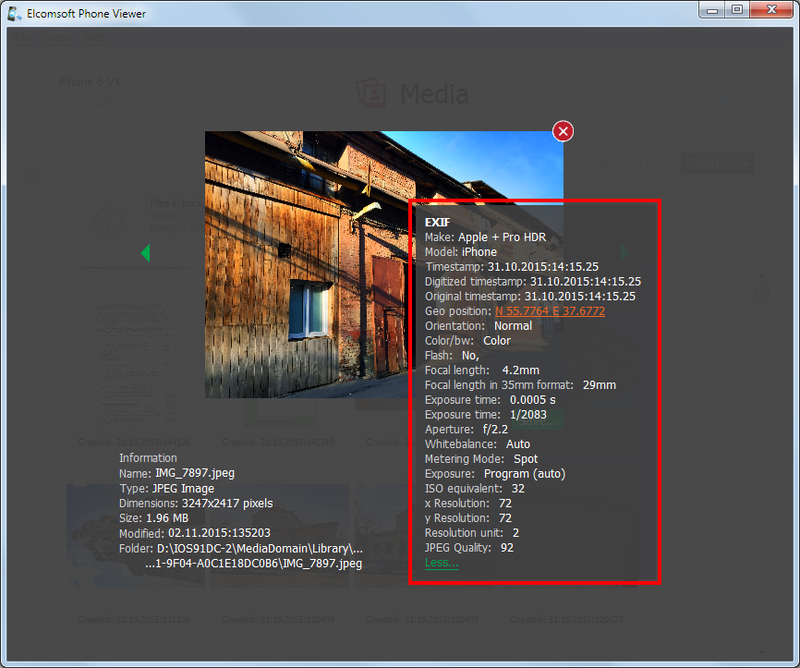 Access EXIF information stored in the images with ease. Elcomsoft Phone Viewer displays when, where and in which lighting conditions the image was captured. Detailed camera info allows determining whether an image was captured on this device or received from another one. Looking for images captured around the time of an incident? Just specify a data range, and Elcomsoft Phone Viewer will automatically display images captured during that period based on the images’ EXIF tags. Elcomsoft Phone Viewer is the perfect tool for exploring information contained in online backups downloaded from the cloud, while Elcomsoft Phone Breaker is the perfect tool for downloading mobile backups from iCloud (iOS devices), and Windows Live! (devices running Windows Phone 8/8.1 and Windows 10 Mobile). Use Elcomsoft Phone Breaker to quickly download selective information from Apple iCloud, and review information you acquired in Elcomsoft Phone Viewer. The two tools enable investigators obtain essential information about the suspect such as their calls, messages, address books and location history in a matter of minutes. Elcomsoft Phone Viewer is a perfect tool when time is the ultimate priority. By using Elcomsoft Phone Viewer together with other ElcomSoft tools such as Elcomsoft Phone Breaker, investigators can save time by reviewing essential bits of information in just a few moments. By quickly download selective information from Apple iCloud with Elcomsoft Phone Breaker and viewing acquired information in Elcomsoft Phone Viewer, investigators can obtain essential information about the suspect such as their calls, messages, address books and location history in a matter of minutes. The ability to view Calls and Messages databases with many thousand entries as well as convenient full-text and category-based searching and filtering make navigating through acquired information a snap. Search through thousands records in a snap! Elcomsoft Phone Viewer offers real-time filtering and full-text searching, allowing examiners locate records of interest in a matter of seconds. Search through Contacts, Calls, Notes and Messages, look up contact by names, numbers and other available fields, and locate messages with full-text search. With real-time filtering, you can opt to only display favorite contacts or only display contacts from one or more accounts (Exchange, iCloud, Google, Facebook, or any combination). For messages, you can specify date range, type of message (SMS, MMS, iMessage) and whether to display incoming, outgoing or all messages. Elcomsoft Phone Viewer is a fast, compact tool that requires no learning curve. Using Elcomsoft Phone Viewer is just as easy as viewing an Excel spreadsheet. Designed to simplify the entry into mobile forensics, Elcomsoft Phone Viewer offers more than enough features for many IT security departments, offices and one-off investigations. Synced data from iCloud such as call logs, Safari tabs and bworsing history, calendars, notes etc. For iOS device backups, Elcomsoft Phone Viewer can work with ones in the original iTunes format, and supports backups with converted/restored file names. Partial backups (select categories downloaded from iCloud) are also supported. 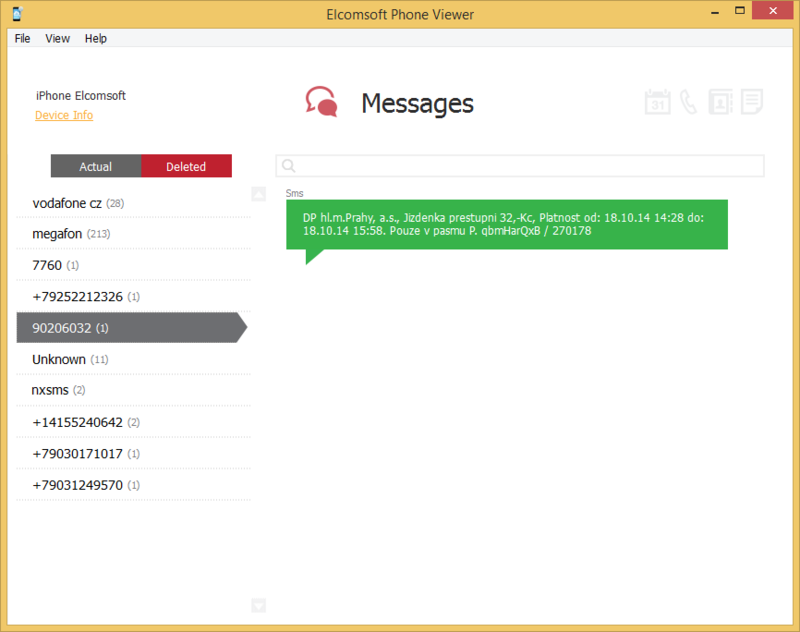 Elcomsoft Phone Viewer for Windows runs in 32-bit and 64-bit editions of Windows 7, 8, 8.1, 10, as well as Windows 2008, 2012 and 2016 Server; Mac version requires OS X from 10.11 to OS X 10.14 (Mojave). Elcomsoft Phone Viewer operates without Apple iTunes or BlackBerry Desktop Software being installed. New media formats are not currently supported.